RANGERS and Aberdeen will do battle again in the Scottish Cup quarter-finals following this afternoon’s draw at Pittodrie. A Sam Cosgrove penalty on 11 minutes was canceled out by Joe Worrall three minutes after the break to ensure the two will meet again at Ibrox, with that replay tie currently scheduled for Tuesday 12 March at 7.45pm. Manager Steven Gerrard opted to name an unchanged side from the one which defeated Dundee 4-0 at Ibrox in midweek – the first time he has done so since the Rapid Vienna and Hearts back-to-back matches in October. Unusually for these matches, it was a pretty tame start, with both sides really failing to do anything in the advanced areas, but with eight minutes showing on the clock, a rash challenge from Connor Goldson in the box brought down Gary Mackay-Steven for a penalty to the home side. After a delay of almost two minutes, up stepped Sam Cosgrove to take, and while Allan McGregor got a hand to the striker’s effort, it proved just too powerful and nestled in the back of the net. 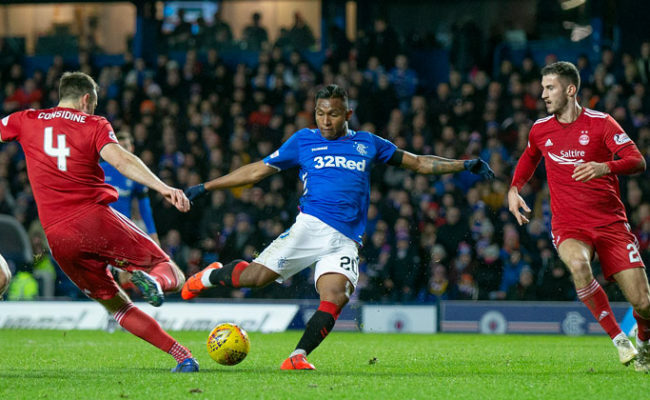 Gers responded well, with Alfredo Morelos testing Joe Lewis with a decent effort after breaking down the right, before the Colombian saw yellow for simulation, going down under a Scott McKenna challenge in the box. McKenna had a great chance for 2-0 on 32 minutes, heading a Niall McGinn free-kick over the bar at the back post, before McGinn himself had an opportunity, firing over the bar on the volley from just inside the area . 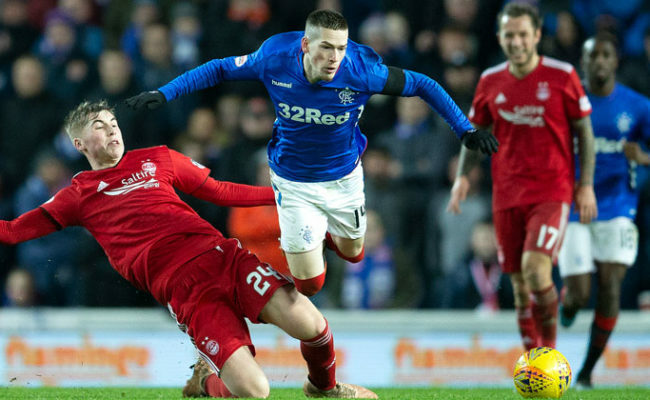 Ryan Kent had a decent opening for Gers next, being released on the left by Ryan Jack, but as the Dons got men back, the winger’s final effort from an angle was over the bar. Steven Gerrard clearly had harsh words for his side at the interval, and within three minutes of the restart, they were level. Ryan Kent’s corner was almost met by the head of Morelos inside the area, but coming in at the back post with a superb finish on the half-volley was Joe Worrall for his first goal in the blue of Rangers. It was a much-needed boost for the visitors, and it gave them a platform to gain a little more control of the game than they had enjoyed in the first-half. Indeed, on the break, they should have taken the lead on 59 minutes following a superb breakaway led by Daniel Candeias. Haring away down the right, he sent a beautiful ball across the field for the incoming Kent, but he couldn’t take the ball in his stride to get an effort away, and instead it bounced for Scott Arfield who shot over the bar on the volley from the edge of the area. Gers then survived a super Dons chance from a corner kick, with Arfield clearing a McKenna header off the line, before Ryan Jack blocked the rebound on the line from a Cosgrove effort. The home side then had another opportunity from a ball into the area causing problems, and Allan McGregor was forced into a sublime save from Andy Considine who shot on the turn from around 10-yards out. At the other end, McKenna had to make a superb block to deny Morelos from another Kent corner in the dying minutes, but that was to be in in terms of scoring chances, meaning these sides will do battle again on Tuesday week at Ibrox. 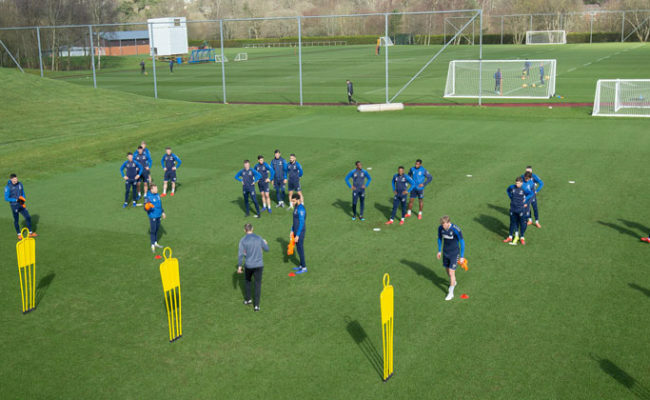 SUBS NOT USED: Foderingham, Katic, Halliday, McCrorie, Coulibaly, Defoe, Lafferty. ABERDEEN: Lewis, Ball, Considine, McKenna, Lowe, Ferguson, Shinnie, Stewart, McLennan (Wilson, 85), Mackay-Steven (McGinn, 16), Cosgrove. SUBS NOT USED: Cerny, Devlin, Gleeson, Campbell, May.